This year, I was incredibly fortunate to have the chance to participate in a field trip to Dunhuang, China as one of the lucky students enrolled in the ‘Making Pictures in Medieval China’ course offered at the Art History Department of the University of Toronto. Led by professor Jenny Purtle and funded by the Getty Foundation and as part of the ‘Global and Postglobal Perspectives on Medieval Art and Art History’, a three-year collaborative initiative that aims to connect art histories and increase international intellectual exchange, the field trip to Dunhuang was the perfect way to wrap up the amazing learning experience. Taught by guest professor Yudong Wang of the Guangzhou Academy of Fine Arts (GAFA) in China, who was also one of the supervising scholars on the trip, the course ‘Making Pictures in Medieval China’ covered diverse topics on Medieval Chinese Art, from early medieval funerary objects in Central China to late medieval Buddhist art on the Silk Road. Dunhuang, as one of the most significant sites of Buddhism and Buddhist art in China, was of course the main focus of the course and the destination of our class field trip. Under the supervision and guidance of U of T scholars Jenny Purtle, Jill Caskey, Linda Safran and Adam Cohen along with GAFA scholars Yudong Wang, Qingquan Li, and Qingquan Zou, students from U of T lived, studied, and collaborated with students from GAFA over the course of ten days from May 15 to 25 in Dunhuang. We visited more than thirty caves at the Mogao Grottoes and at the Yulin Grottoes, many of which were not often open to the public. Students from U of T and GAFA prepared presentations everyday to be given on site. For each cave that we visited, two or more presentations were performed on different aspects of the cave, such as its history, painting technique, iconography and religious significance. In addition, the students from U of T also presented their final term papers in the specific caves that they researched on. Another M.A. student from our department and my fellow colleague in Buddhist Studies, Shum Cheuk Shing also participated in the field trip and presented his paper on the Hindu deities painted on both sides of the main Buddha sculpture in Mogao cave 285. I presented my paper “Patrons of the Steppes: A Look into the Mongol Presence at the Dunhuang Mogao Grottoes” on one of the most esoteric caves at Mogao – cave 465. I was supremely honored to be able to share my research with my peers right inside the cave, which has not been opened to the public since the 1980s due to its sensitive content and history. In my paper and presentation, I problematized the conventional dating of cave 465 to the Mongol Yuan Dynasty and suggested that it was a cave maintained in a combination of efforts of different cultures of people from different dynasties but under the same politico-religious agendas. I clarified the relationship between the Xixia Kingdom (when the cave was first constructed) and the Mongol Yuan Empire (when additional donor paintings and inscriptions were added to the cave) and focused on how Tibetan Buddhism became a highly politically practical tool for the making and ruling of both imperial states. The students on the trip from both institutions of U of T and GAFA came from different disciplines. 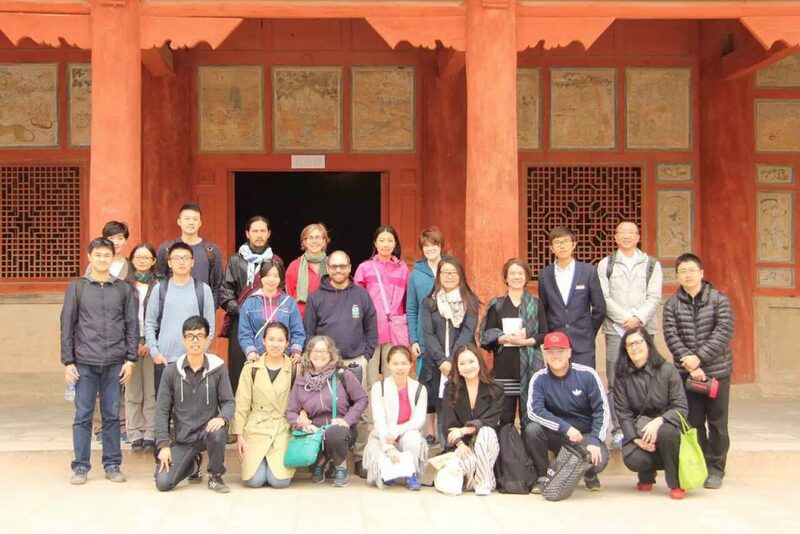 While most participants on the trip were graduate students of Medieval Art History, there were also a few participants from different disciplines such East Asian Studies and Religious Studies who work on Chinese Art and/or Buddhism. It was incredibly interesting and invaluable to see the various approaches to methodology taken by students of different academic backgrounds. Out of impassioned discussions and our collaborative efforts to construct global and postglobal perspectives on Art History, Dunhuang emerged at the end as a perfect site to negotiate issues of the global vs. the postglobal and as a remarkably relevant field in which more interdisciplinary collaborations between international scholars of history, art, and religion should be encouraged. Daigengna Duoer is a second year M.A. student at the Department for the Study of Religion. She studies Mongolian Buddhism and is interested in the relationship between Buddhism, politics, and ethnic identities in modern and contemporary Inner Mongolia.